Why is it so difficult for anthropologists to take sides and express their opinions? Why are conference papers read instead of being presented in an engaging way? 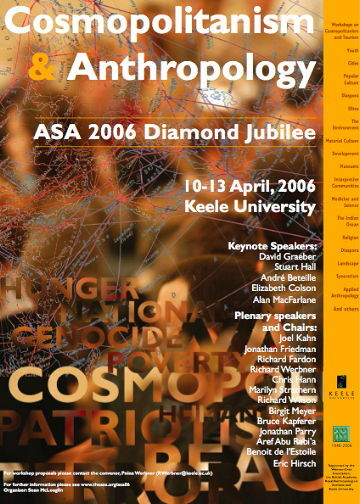 I returned from the ASA conference ‘Cosmopolitanism and Anthropology’ at Keele University with many questions. The topic seemed to have attracted a certain kind of people. The majority of the delegates were migrants of sorts. If you saw a woman wearing a badge with ‘Aberdeen University’ on it, you could be sure that she was not Scottish, but from Malta. An anthropologist displaying the name badge of a Canadian university revealed that she was from Turkey but actually ‘a product of Norway’. The social part was great: the ASA did well. But with regard to the topic of the conference, I wonder if I might have learned more had I stayed at home and read the papers on my own. There were many weak presentations: I was shocked to see many anthropologists just stand there and read their papers monotonously. There was no interaction with the audience, no illustrations, and barely any discussion afterwards because many went over time. Torture for the audience, in other words. This is different from my experience of conferences in Norway, where papers are presented without reading (at least when there are no international guests) and engagement with the audience is a pre-requisite. Reading a paper was taboo, also, at the University of Basel (Switzerland) where I studied during the 1990s. We would not even have been allowed to graduate if we had offered this kind of presentation. In order to come to grips with British conference culture I consulted some informants. An experienced delegate told me: ‘if you want to be considered a serious academic you have to read your paper. That’s standard and just the way it is.’ Other informants confirmed the existence of this ‘tradition’. But as we anthropologists know, traditions aren’t divine ordinances – they were invented somewhere by somebody. As I noticed that several participants left before the presentations ended, and heard other critical voices (‘it’s my first and probably my last conference’, a PhD student told me), I wondered: why doesn’t anybody use this anthropological insight to rejuvenate conference culture? Another of the questions that arose for me was: why is it so difficult for anthropologists to take sides? Cosmopolitanism is a topic that many participants, with their transnational backgrounds, had a personal affiliation with. Nevertheless, the potential of cosmopolitanism for solving the growing polarization between ‘the West’ and the ‘Islamic world’ and related questions (should schools educate us to be cosmopolitans rather than loyal nationalists? How could anthropologists contribute to a more peaceful, just, cosmopolitan world?) was barely touched on (save for one parallel session). Instead, extreme relativism prevailed. The French anthropologist Benoît de L’Estoile argued that we should not define the term cosmopolitanism by its moral qualities (openness to the world, empathy etc. ), as this would entail defining some people as either good (cosmopolitans) or bad (non-cosmopolitans) – problematic, according to L’Estoile. He therefore proposed defining cosmopolitanism by how people make use of their transnational networks. On the last day of the conference, Keith Hart declared (perhaps a touch harshly), ‘Anthropologists don’t care for cosmopolitanism. It’s just an excuse to come together. We’re not engaging in the world. We don’t talk about Iraq and Iran. Our detached discourse lacks wider relevance.’ As I have since found out, many delegates would agree with Hart’s view, but perhaps didn’t dare to say so openly. Nevertheless, we did hear some engaging speeches and many important points were made. Paper-givers tended to offer a more optimistic account of the state of the world than mainstream media. They talked about the long history of peaceful coexistence of people with different backgrounds. Cosmopolitanism, the will to live with difference, is everywhere: in conflict-ridden places like Israel and Palestine (Aref Abu-Rabi’a), among Muslim women’s groups (Maila Stivens), in supposedly isolated places like Papua New Guinea (Eric Hirsch) and among reputedly nationalist movements and folk musicians (Caroline Bithell). Cosmopolitanism is not simply a Western discourse. In one of the most impressive papers, Owen Sichone claimed we could find more evidence of cosmopolitanism in remote African villages and congested urban slums than among the European elite. He talked about poor South African women who take care of migrants and refugees from other African countries. These women, Sichone said, have never left their homes, but ‘they live their cosmopolitanism by welcoming the world’. Their engagement stands in sharp contrast to the activities of some European capitalists who, because of their history of colonial oppression and the failure to protect refugees in Europe, cannot be called cosmopolitan according to Sichone: ‘If cosmopolitanism is a devotion to the interests of humanity as a whole then there is nothing more uncosmopolitan than millennial capitalism in its various guises,’ he maintained. In David Graeber’s opinion the prevailing discourse about Western values has no cosmopolitan qualities either. It is rather a kind of othering, creating artificial borders between people who have much in common. Graeber deconstructed the concept of the West and showed that democracy – seen by many as originating in ancient Greece and a typical Western value – is something that all people have been striving for in all times (though it has often been stifled by the elites). All in all, the conference showed that by applying a view from below, anthropologists have much to contribute to the development of less ethnocentric theories of cosmopolitanism. How To Present A Paper – or Can Anthropologists Talk? Do they memorize the papers in Norway?